Foreign aid, the international transfer of capital, goods, or services from a country or international organization for the benefit of the recipient country or its population. 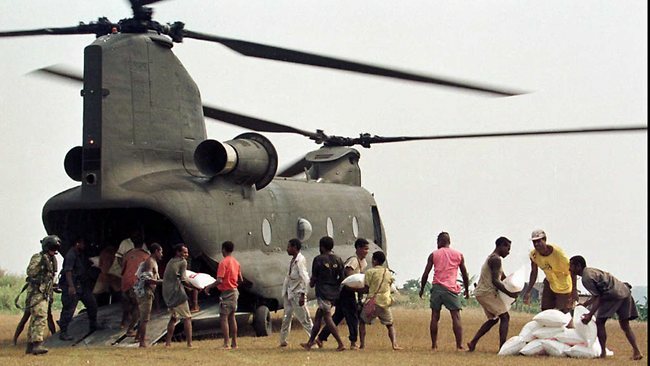 Watch a Video-What is foreign aid? Multilateral aid is assistance provided by governments to international organisations like the World Bank, United Nations and International Monetary Fund that are then used to reduce poverty in developing nations. In 2006-7, the Australian Government committed $400 million in multilateral aid. Non-government aid is assistance provided by non-government organizations (NGOs) like World Vision, the Red Cross and Oxfam. The money for this aid is mainly provided by public donations from individuals and businesses. However, NGOs also receive some funding from government. This type of aid is traditionally extended to nations which are victims of natural disasters, such as floods, famines and epidemics. This is short term aid and does not have to be repaid. Humanitarian aid is per se non-political. relief coordination, protection and support services (coordination, logistics and communications). But humanitarian aid can also include reconstruction and rehabilitation (repairing pre-existing infrastructure as opposed to longer-term activities designed to improve the level of infrastructure) and disaster prevention and preparedness (disaster risk reduction (DRR), early warning systems, contingency stocks and planning). Under the Organisation for Economic Cooperation and Development (OECD) Development Assistance Committee (DAC) reporting criteria, humanitarian aid has very clear cut-off points – for example, ‘disaster preparedness’ excludes longer-term work such as prevention of floods or conflicts. ‘Reconstruction relief and rehabilitation’ includes repairing pre-existing infrastructure but excludes longer-term activities designed to improve the level of infrastructure. Humanitarian aid is given by governments, individuals, NGOs, multilateral organisations, domestic organisations and private companies. Development aid is financial aid given by governments and other agencies to support the economic, environmental, social and political development of developing countries. It is distinguished from humanitarian aid by focusing on alleviating poverty in the long term, rather than a short term response. Major part of the developmental aid comes from government sources as official development assistance (ODA). The remaining comes from private organisations such as "Non-governmental organisations" (NGOs), foundations and other development charities (e.g., Oxfam). Nation Tied Aid: is given to the recipient country on the condition that she will spend it in the donor country to solve the BOP problems of that country and to stimulate exports, i.e., if Pakistan is given aid by US and is asked to import raw materials or machinery from US only then it is ‘nation tied aid’ or ‘resource tied aid’. Project Tied Aid: is given only for specific projects and the recipient country cannot shift it to other projects. (ii) Untied Aid: Untied aid is the aid which is not tied to any project or nation. It is, in all respects, better than the tied aid because it offers more efficient use of foreign resources. It is much desired because in the case of untied aid the recipient country is not bound to spend the foreign resources on specific projects or in the donor country which may charge higher prices than international market. (iii) Grants: A grant is that form of foreign aid which does not entail either the payment of principal or interest. It is a free gift from one government to another or from an institution to a government. It is much desired because it increases the internal expenditures and generates income. It is given on the basis of humanitarianism, especially in days of emergencies, earth quakes, floods, wars, etc. Hard Loans: Hard loans are also called short-term loans. In order to finance industrial imports they are given usually for a period less than five years, and they are paid in the currency borrowed. It contains no concessional element but interest rate is usually lower than the prevailing rate of interest in the international market. Soft Loans: Soft loans are also known as long-term loans. Soft loans are made for 10-20 years and it is repaid in the currency of recipient country. Interest on these loans is lesser than hard loans and often these loans invoice grace period. Concessional elements are comparatively greater. In Cash Form: If it is received in cash form it may be more helpful because then a country may buy more commodities from cheaper sources. In Food Grain Form: It is a special type of commodity aid, which is given in the form of food grains only. There is more than enough food produced each year to feed adequately everyone on earth. However, food is so unevenly distributed that malnutrition and hunger exist in the same country or region where food is abundant. Critics of food aid argue that it increases dependence, promotes waste, does not reach the most needy and dampens local food production. Nevertheless, the food aid has frequently been highly effective. It plays a vital role in saving human lives during famine or crisis, and if distributed selectively, reduces malnutrition. Unfortunately, poor transport, storage, administrative services, distribution networks and overall economic complex hinder the success of food aid programmes, but the concept itself is not at fault. Through Recruitment: Technical assistance may be given through recruitment. Selected people of recipient country are recruited in the donor country for service overseas, partly, often largely, at the expense of the donor government. Through Scholarships & Training Facilities: The second form of technical assistance is scholarship and training facilities in donor country for foreign students (from recipient country). not-for-profit, voluntary citizen’s group, which is organised on a local, national, or international level to address issues in support of the public good. Task oriented and made up of people with common interests, NGOs perform a variety of services and humanitarian functions, bring citizens concerns to governments, monitor policy and programme implementation, and encourage participation of Civil Society stakeholders at the community level. NGOs have, since the end of the Second World War, become increasingly more important to global development. They often hold an interesting role in a nation’s political, economic or social activities, as well as assessing and addressing problems in both national and international issues, such as human, political and women’s rights, economic development, democratisation, inoculation and immunisation, health care, or the environment. However, in the developing world, the role of NGOs is often critical. In years of drought or famine, the non-governmental organisations have been pivotal in providing food to those most marginalised. NGOs often provide essential services in the developing world that in developed countries governmental agencies or institutions would provide. Normally, NGOs provide services that are in line with current incumbent governmental policy, acting as a contributor to economic development, essential services, employment and the budget. In a wider approach, NGOs are also the source and centre of social justice to the marginalised members of society in developing countries or failed states. NGOs are often left as the only ones that defend or promote the economic needs and requirements for developing states, often bringing cases to the International Monetary Fund, World Trade Organisation and World Bank. Developing nations and NGOs often find allies in one another when opposing legislation, economic terms or agreements from global institutions. If the Millennium Development Goals are to be achieved in many of the developing, the role of NGOs will have to be recognised by the international community. Their efforts are often more effective than much bilateral aid. However, the role of NGOs has also been criticised, as many international experts estimate that much of the work done by NGOs is not harmonised or tailor-made to the countries preferences and peculiarities, causing the quality of aid to suffer.